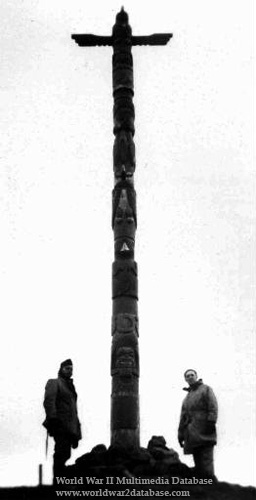 Americans on Kiska with a totem pole, carved during World War II in the Aleutian Islands by American occupation forces. The totem pole was erected on Kiska Island while Naval forces occupied the island. In the early 1960’s, during a military clean-up, it was shipped to a Navy base in California. Eventually, it was donated to a group of Boy Scouts in Lebanon, Tennessee. It made a 4,000 mile journey back to Alaska, thanks to the efforts of Tennessee Native Americans and the generosity of a Tennessee Boy Scout group. Alaskan Native Americans suggested the totem be donated to the Museum of the Aleutians. It was picked up from the Boxwell Boy Scout Reservation in Wilson County, Tennessee, on March 13, 1999 and delivered to Unalaska Island, Alaska on April 24. The totem pole is unusual in that Native Americans sought to return an object that probably wasn't carved by Alaskan Aleut Natives, but by white soldiers.